Nature’s GPS: It’s Not As Batty As You Think! When your younger siblings or the kids you’re babysitting start bouncing off the walls and driving you insane, you’re more likely than not to blame their behavior on a “sugar high.” But is sugar actually the culprit? Years of oral tradition say yes, but modern science disagrees. Science first became interested in the link between sugar and hyperactivity when the Feingold Diet became popular in 1973. Devised by allergist Dr. Benjamin Feingold, it advocated the removal of food additives, such as dyes and artificial flavors, from children’s diets because they might lead to hyperactivity. Although this special diet did not originally mention sugar, sugar became grouped under the category of food additives due to the common belief that it affected behavior. Through various experiments over the years, scientists have discovered that no substantial evidence exists to support the claim that sugar causes hyperactivity. For example, University of Kentucky’s Dr. Hoover observed that removing and adding food additives in children’s diets provoked reported links to hyperactivity from parents although objective clinical tests proved otherwise. Dr. Wolraich from the University of Iowa gathered one group of normal preschoolers and another of those who were reportedly sensitive to sugar. He gave them sucrose, aspartame, or saccharin, the latter two of which are believed not to have any effect on behavior. After tests for hyperactivity, he was unable to find any significant differences in the children’s conduct. In a similar experiment, Dr. Shaywitz of the Yale University School of Medicine reported the same results for high doses of aspartame. Nonetheless, other experiments show that sugar may at least influence behavior. 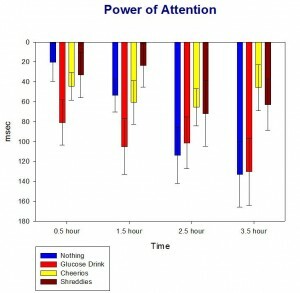 Dr. Wesnes conducted a study in which he found that having a large amount of sugar for breakfast led to a severe deterioration of attention span when compared to having no breakfast or eating whole grain cereal. Dr. Tamborlane, also from Yale, reported that children given sugar had higher levels of adrenaline. A possible explanation for this effect is that since sugar is quickly absorbed into the bloodstream, blood sugar rises quickly, which can lead to higher adrenaline levels and thus symptoms similar to those associated with hyperactivity. Furthermore, children with ADHD also tend to have higher levels of insulin. Dr. Eugene Arnold from Ohio State University reported that more sugar leads to the production of more insulin, which depresses neutral amino acids in the blood, such as phenylalanine and tyrosine. Those particular amino acids are important because they are precursors to dopamine and norepinephrine, both of which play a large role in ADHD when their levels are too low. At the same time, however, tryptophan is slightly less affected by sugar intake, so when competing to cross the blood-brain barrier, more tryptophan can enter to spur serotonin release even when sugar-depressed neurotransmitters are unavailable. Thus, in this case the effect of sugar is likely mitigated. In 1982, the National Institute of Health announced that no link between sugar and hyperactivity had been scientifically proven. Why, then, does this myth still persist? It may be mostly psychological. As previously stated, experimentation has shown that parents who believe in a link between sugar and hyperactivity see one, even though others do not. Another possibility is that children tend to be more excited at events like birthday and Halloween parties where sugary foods are usually served . People may have confused proximity with correlation although the environment is probably more to blame than the food. But that doesn’t mean it’s okay to let children gorge themselves on sweets. 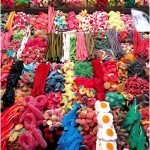 Although sugar may not be linked to hyperactivity, it certainly is linked to obesity, diabetes, and cavities. There is no danger in limiting children’s sugar intake; however, Dr. Arnold warns that this myth can lead to the mistaken belief that sugar substitutes like aspartame are a better choice. We may have a whole new myth on our hands to bust.